...I saw the tent collapse. I was at the fire with my wife, mother and dad. I was home while waiting to go on duty in the Navy. We had reserved seats high at the end by the bandstand. Clyde Beatty's animal act was on in front of us. The fire started of to the left. As people panicked, Dad and I made the women sit still. When the aisle cleared, we walked down it and out the nearest exit. The band was still playing. When I turned to make sure Mother and Dad were with us, I saw the tent collapse. In 1949 I took my six-year old daughter to the circus in Wilmington, DE. When I requested two seats in the top row, the ticket seller asked why I wanted such less desirable seats. I told him "I was at Hartford". This created quite a stir. My older stepson was a clown with the circus when it no longer played in tents. I am 89 now and live in Wilmington, NC. My dad was at that circus and under the bigtop at the time the fire started. 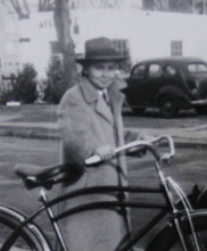 His name was Jack E. Mahar and he was 6 years old at the time. His brother David was only 3 years old at the time so he stayed home. My dad, Jack, actually spotted the fire and alerted his dad, Edmond J. Mahar. Edmond picked Jack up, put him on his shoulders and ran away from the bottleneck of people and towards the fire. My dad had a small burn on his left knee but that was the worst of it. They escaped virtually unharmed. Jack passed away in 2002. My dad and his family lived at 89 Bentwood Rd in West Hartford. My granddad was born in 1903, my dad was born June 25th, 1938. It is still pretty clear in my mind - my aunt told me to run and jump off the bleachers and I did. Someone caught me and kept me until we found some other people that I was with. Eventually we came to the car and the other woman and her son were waiting there for all of us. In the meantime, my aunt (Mae Avery), cousin (Sandra Avery) and grandmother (Martha Moore) were trying to get out. Martha was sent to the hospital and my aunt continued to look for me, and eventually got back to the car and saw all of us. That's all that happened to me. I was a lot luckier than the other survivors. I do remember everyone running toward the entrance they came in, even my aunt. Where we were sitting we weren't too far from an exit. I have heard it said people to tend to go toward the same way they came in in an emergency. ...left a mark on their lives forever. My parents, Walter and Mary Ann Luszczewski, were married in Cleveland on February 9, 1944. They were stationed in New London, CT where my Dad was the Chief of the boat on the USS Caiman, newly constructed in Groton and about to begin her war patrols. On a lovely summer day, my father took my mother, who was pregnant at that time with my sister who was born November 11, to the circus. It was a day they would never forget and that would affect the childhoods of my sister and me forever. We never saw a circus and the circus coming to town was a cause of great distress to my parents. The sound of elephants braying brought out a strong reaction in both of them for the rest of their lives. They were both very afraid of fire and sensitive to the smell of smoke. Although they were not injured, the experience left a mark on their lives forever. On July 6, 1944, my mother and I were driven by my uncle (I think) to Hartford, CT to see the great Ringling Brothers, Barnum and Bailey Circus. We were accompanied by Siri Montagna and her daughter Karen. At the time, I was 13 years old and Karen was about 8 or 9. The atmosphere was electric with excitement, what with the appearance of live tigers, elephants, lions, and other creatures as we (and they) entered the area where the circus tent was located. I don’t know which direction we were facing, but I will assume it was in the South stands of the tent in order to establish context. We were closer to the top level of seats, which consisted of wooden planks, than the bottom ones. It was very hot inside. We were in a tent, hence no air conditioning. Because of the heat, Siri took off Karen’s dress to make her more comfortable, and I held the dress for her. Karen wore a slip underneath. The show began with great fanfare. I remember the barkers, the clowns, and of course, the wonderful animals. Soon afterward, perhaps ½ hour or so, I noticed a ring of fire in the ceiling of the tent in the northeast corner. It was a surreal experience and I was awestruck at first and did not even know if it was real, perhaps because of the flamboyant, majestic nature of the proceedings below, but it spread rapidly. Soon most of the spectators were stampeding down the stands, trying to escape the horror. Many of them simply rushed to their deaths and probably smothered because of the massive congestion. I recall that the band bravely remained and played “As the Band Played On” to attempt to encourage the crowd. The animals were evacuated by sending them through tunnel-like, metal fencing, which I will call “runways”. I recall remaining very calm, a tribute to the various fire drills and mock air raid practices that we experienced at school. And since I recognized the folly of going down, I took my mother’s hand and traveled upward in the stands. What’s the point of going up in the stands? I simply did not want to go down, and otherwise moved with no specific purpose in mind except to avoid the mob scene below (I can now recognize it as the possible urging of the Holy Spirit). I lost track of Siri and Karen at that point. When we reached the top level of seats, lo and behold, below us was the runway by which the animals were leaving. It was outside the tent, hence it represented safety to us. We then simply jumped down perhaps 3 or 4 feet to the top of the runway and then to the ground. As we walked on the grounds, we saw the emergency personnel removing dead bodies by means of stretchers. I was still holding onto Karen’s dress, but we did not find Siri and Karen. However, I then detected Siri on the top level of the stands, getting ready to jump. She jumped (probably a distance of 12 to 15 feet) to the ground, but landed inside the tent. I suppose by then the runway had been removed or else she was in an area away from the runway. I did not tell Mom what I saw since I didn’t know if Siri was safe or not. Later, Mom said to me, “I think Siri must have been burned”. I still did not tell her what I saw. We finally reached a place where we could make a phone call (no cell phones) and called home. Eventually another uncle came and drove us back home. Subsequently, we finally learned that Siri and Karen were also safe. We all walked away from the incredible Hartford circus fire, but 168 others did not. I looked up and saw pieces of the tent falling in..
...huge rush of people crushing everyone else. My grandmother and her brother were survivors of the fire. My grandmother, Irene Frances Sigal, was a young teenager who had taken her little brother Stanley to the circus that day. When the fire started, she told me of the smoke and the huge rush of people crushing everyone else on their way toward the exit. She grabbed her brother Stanley and tried to find another way out. Someone had lifted a side of the tent, and she and Stanley got out uninjured. My grandmother was a survivor twice - in 1979 she was seriously injured by a bomb planted by a terrorist near a hotel in Tiberias, Israel. She fought to survive, and not only did she recover, but she proved her doctors wrong having been told she would never walk again. ...heavy cloud of smoke in the distance. July 6, 1944 is a date many residents of Hartford, CT will not forget. I still remember sitting on the stoop outside of our building at 166 Barbour St., several blocks South of what was known popularly as the circus grounds. The heat that day was incredibly intense. The type of heat that totally saps your energy. It was also incredibly quiet. I don't recall seeing anyone or any traffic on the street (Barbour St. was a very long and wide street and a main bus route in North Hartford) probably because so many people were attending the afternoon session of the Ringling Bros., Barnum and Bailey circus. Also, World War II was still underway and for those who had cars, gas was still a scarce commodity. Because of his work schedule, my father had taken me and my sisters to the circus the prior evening. I had completed first grade at St. Michael's school that June. The silence was suddenly broken by the sound of sirens. I saw a lone car speeding down Barbour St. in the direction of the circus grounds. Soon there was more and more traffic. I recall suddenly seeing a man standing in the middle of the intersection of Barbour and Westland Streets frantically directing traffic. He did not appear to be a policeman. One of the early cars speeding down Barbour Street was driven by Father Looney, assistant pastor of St. Michael's Church. He was one of the first priests on the scene, administering last rites to many of the victims. It was commonly believed that this experience led to his poor health and an early death a few years later. I recall running up to our second floor apartment and learning from my parents that the circus was on fire. They gave us strict orders not to leave the house so we would not be tempted to head down to the fire scene. I recall seeing from one of the windows the heavy cloud of smoke in the distance. Later in the afternoon, friend of my parents, the Lynchs, came to our house to see if their daughter, a friend of one of my sisters, who had gone to the circus might possibly be at our house. She was not, but was later reunited with her parents. I learned the next day that one of my friends from first grade, Billy Dineen, had been killed in the fire. Billy's funeral was one of many that were held in the remaining weeks. My parents Frank and Rose Sullivan were 37 and 40 respectively at the time of the fire. Dad worked at the Hartford Times as a linotype operator and it was his day off. My father took my sister and I to watch them set up the tents the day before. I was 5, my sister Eileen 3. You can't understand how exciting that was today in an age of TV and internet. The show itself couldn't come fast enough. On July 6th, my immediate family plus aunts and cousins arrived on the circus grounds and split into two parties as the tickets were for two different locations. My dad took me with him. The others, my mom; my aunt Ella Russo, 38, the one who purchased our tickets; aunt Amy Montano, about 35 and pregnant, carrying twins, which she would lose because of the trauma of the fire; my cousin Jerome Montano, 3; my cousin Vincent Testa, 10; and my sister took the other seats nearer the front entrance. When the fire broke out, dad put me on his back and leapfrogged chairs. At the stairs over the animal chutes in a crazed crowd, Dad slipped and fell with me. A man assisting folks in trouble picked us both up and threw us over the chute to safety. As I hit the ground, I remember looking back and seeing a big flaming tent pole come crashing down not far from where we had just left. Over the years, I've always wondered whether that man survived because I probably owe him my life. We got up and continued out the rear entrance, then making our way around to the front looking for family. My sister and cousin Jerome were thrown down from the top of the stands and successfully caught. Vincent was allowed to forge ahead of everyone because my mom and aunts thought he was grown up enough to get out on his own. No one could guess how vicious the fight for survival would be. My cousin Jerome once told me he had his arm get caught somehow in the animal chute and how he pried it loose just in time and of course we know now how dangerous a location that was to have a problem in. As we fled the tent, in all my boyhood naivette I remember begging my father to let me get to a fire box and sound the alarm, this with fire engines already pulling up outside. In front, a gruesome scene of blackened, smoking bodies on the grass was already unfolding. After a few minutes, police forced us out of the area. We soon encountered a little boy like me and his mom who was distraught. My dad examined a small burn on the boy's hand and coldly dismissed it as slight, telling her to get him to a doctor's office. After what we had just seen moments before, who could blame him. In a short while, we found my mother lying in an overgrown lot near where we left our car, crying hysterically. "Everyone's o.k., but we can't find Vincent," she wailed. Later that evening we would find out that my first cousin Vincent, the boy who took me to Vine Street School everyday, had been trampled to death. He was such a lovely boy. Sometimes, he’d bend over so I could climb onto his back for the walk to school. Other times he’d sing duets with my mother “Would/Do you wanna wish on a star, carry moonbeams homes in a jar,” a popular Bing Crosby song of the times. The entire family, led by my Italian grandmother Lillian, immediately went into mourning. There was no consoling my aunt and uncle, Vincent's parents. In the weeks and months to follow, Laura, his mom, almost had a nervous breakdown, still looking out her front window and expecting her only child to come running in from school. Perhaps only the intervention of Beatrice Auerbach, my uncle's employer at G. Fox & Co., saved the day. She sent her private nurse to be with my aunt for a couple of weeks to get her through her anguish. But, I can say with certainty having known and loved them their whole lives, the pain from this loss never left them until the day they died. That their next born, daughter Claudia, two years later, became Claudia Weicker, First Lady of Connecticut, is an interesting sidebar to this story. The wake was my first and very intense. I can’t remember details but I do know from future experiences my Noni Lillian, 68, would almost go into a keen (O, dia/dio) and collapse at family suffering. Even though I was barely six years old, the events of that day and afterward are seared forever in my memory. How could it not be, it was absolutely horrifying. A year later I transferred to St.Joseph Cathedral School on Asylum Hill and over my time there I encountered lots of others who had been there, some who had cut their way thru the circus tent with Boy Scout knives. 15 years later while serving in the USAF I experienced the only other large scale fire of my life. I never want to see a third. I was in a WWII hanger on work detail when it caught fire and burned to the ground in 10 minutes flat. An airman was swabbing the floor down with high octane airplane gas and it ignited when he went to hose it down. Just the friction from trying to screw a hose to a faucet supplied the spark. Suddenly I heard a huge sucking sound (oxygen being sucked) and 75 ft away the airman racing ahead of a wall of flames, his brogans afire. We shot out the back door. Thank God everyone got out alive. The reason I bring this up is this: I have a memory of a terrible sucking sound like that at the Circus Fire as the fire advanced across the bigtop. Has any other survivor ever mentioned it? I’ve never heard of anyone else who has. Maybe I imagined it. My mother, Rose Sullivan, always said, "Everytime I see a sunset, it reminds me of the circus fire." Though my mom expressed herself through that quote, my dad never said a word about it. Unfortunately he died five years later and I never had a chance to talk to him about that day. My brother, Carleton Lisk, and friend Donald Miller, both of Rockville, attended the circus and when the fire broke out, both jumped from the top level of the bleachers and fled to a safe area. My wife, Alyce (Wormstedt) Lisk, and her cousin Lydia were both supposed to go with the Kuhnley's, but went shopping in Hartford without informing the family as children are apt to do. When no one knew of her whereabouts, her father, a fire chief, toured all the setup morgues for hours until someone told him that she was home. I was in the Coast Guard at the time stationed in Mobile, Alabama, and called home when I learned of the fire and heard the story. I was 9 years old and I was with my mother Mollie Goldsmith. We were down on left side of the tent in the bleachers. Before the show started, they came around to say the children could go down to the front to sit. I went, but came back. The fire started across from where the injured veterans were sitting. We got out because some one cut the tent. They made us run away from tent because of the animals. I looked back and the tent was all in flames. I am a survivor of the circus fire. My mother Eileen Gallivan (interviewed by a local newspaper for one of the anniversaries) brought my cousin Mary Elizabeth Landers and myself to the circus. Mary and I were both 4 1/2 years old. We were seated on the top bleacher up, against the low wall barrier, immediately to the left of the main entrance as one enters. We were late, and all the seats were taken, requiring my Mom to climb to the top bleacher seat with two 4 year olds. That action is what saved us. We were out of the crush of people, allowing my mom to take stock and decide that we would jump down over the back of the bleachers. She said that climbing up to the top was tedious with two 4 year olds, climbing down with everyone pushing and shoving was not an option. We were told to hold hands and not let go and to crawl under the tent, go across the street and wait for her. Then she added "don't look back". She later said that she was worried that she would break something when she jumped and that we would come back to her. On the count of 3 twice and with a little encouragement ("I said JUMP") from my Mom, we jumped. There had been a heavy set man sitting next to us that also jumped and he crawled under the tent. The hole became larger, making our crawl under easier. Mary and I got outside (still holding hands) only to come to a stop because of the great pandemonium. My Mom arrived seconds later and we ran across the street. By the time we got there and turned around the tent was totally on fire. We then started walking. That is when Mary and I stared complaining bitterly. It was very hot and we were crying. We walked and walked. My Mom had only one shoe on, she had lost the other in the jump. I can only imagine now how hot that sidewalk must have been. Finally, a truck came by and the driver asked if we needed help. We piled onto the front seat with him and he drove us to the Isle of Safety where we caught a bus home.